Like every other South African township, on the streets of Khayelitsha, the minibus is ubiquitous. But only one of them has counselling and support as its purpose, and it belongs to Banetsi Andreas Mphunga. 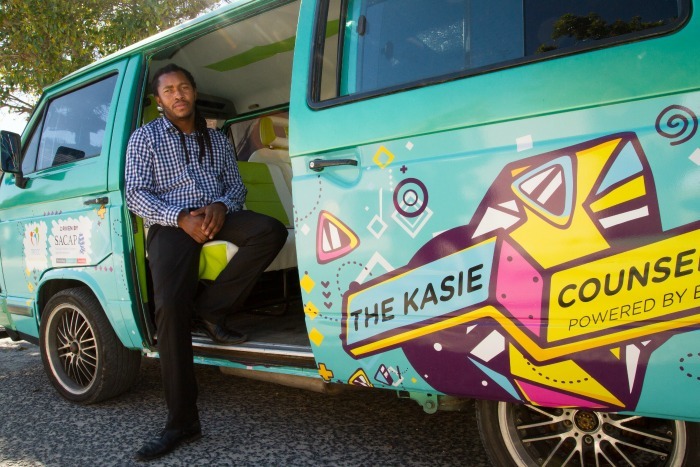 A psychology graduate, and one of just a handful of Registered Counsellors available to the almost 400 000-strong population of Khayelitsha, Banetsi is so committed to providing mental health support to his community that he bought a combi and transformed it into a mobile counselling clinic. Khayelitsha, like many communities in South Africa is under severe strain. Alcohol and drug abuse, gangsterism and crime, domestic and sexual violence are rife. To address some of these issues, Banetsi established the Township Parents and Children’s Counselling Centre (TPCCC) as a community resource to provide individuals and families with support for their psychological needs and to alleviate emotional distress and combat the insidious and debilitating effects of the social challenges they face daily. In an environment fraught with trauma and abuse, seeking clinical help during emotional life struggles is often impossible due to the scarcity of mental health resources and the cost attached, particularly if you are young. Banetsi’s cool, mobile psychology clinic aims to break down these barriers to treatment and normalise seeking professional help in tough and shocking times. SACAP’s vision and mission is rooted in the broadest context of South African society. The educational institution has a vision of an empowered society knitted together by integrated, self-aware individuals in healthy relationship with one another, their families, communities and society at large and is actively engaged in educating for social impact. The relevance and contribution of Banetsi’s mobile counselling clinic, and its goal to take psychology into communities so it can positively affecting social change and bring about transformation has been the driving force of the year-long partnership. Banetsi focuses on youth and　their　families and believes that the mobile counselling clinic is an innovative response to the scarcity of mental health resources within his community. His combi is open to anyone in the community who cannot access or afford mental health services to receive counselling and support as well as education around mental health challenges. Together with SACAP, Banetsi’s vision is to see a fleet of healing minibuses traversing the land and making a difference.